According to the USDA, 80% of Americans are deficient in magnesium. A deficiency in magnesium of such epic proportions is a major contributor to our epidemic of chronic and degenerative disease. Heart attacks, arrhythmia, chronic fatigue, depression, fibromyalgia, heart disease, osteoporosis, are just a few widespread health-destroying conditions linked to a potential magnesium deficiency. What Does Magnesium Do For You? Magnesium is largely responsible for critical metabolic functions such as conversion of carbohydrates, proteins and fats to energy; dilating blood vessels; muscle contraction and relaxation; protein formulation; and removal of toxins from the body. Magnesium is essential for normal heartbeat and nerve transmission. When magnesium is lacking, critical jobs cannot get done, and we suffer lower energy, stamina, endurance, and vitality, resulting in a host of maladies. How Do We Become So Deficient in Magnesium? Magnesium deficiency is exacerbated by poor farming methods, food processing, and a loss of magnesium from our soils. Other factors include an acid-producing diet and lifestyle. Sugar, alcohol, caffeine, stress, white flour, soft drinks, and allergic reactions all produce an acidic environment in the body. Magnesium is used up by the body to buffer and neutralize that acid. The more acid you produce, the more magnesium is lost. To make matters worse, the damage done to gut tissue from over-use of antibiotics and toxicity in the body, combined with toxic fluoride in the drinking water and environment, reduces the body’s ability to absorb magnesium. Simply taking a magnesium supplement is not the quick-solution for many people who discover they have magnesium deficiency. Although most people only absorb 4-to-30% of their dietary magnesium, the solution they require is usually not found in most health food stores. Most magnesium supplements are ineffective. Increased dosages that go beyond the RDA of 300 – 350mg/day to 600 – 700 mg/day in order to meet recommended guidelines by nutritional physicians, is often met with diarrhea and upset stomach. This further leads to more deficiency in the body’s magnesium stores. Since most people have magnesium deficiency, there is a solution that has been touted by some experts as an at-home, effective way to build the body’s magnesium stores without intravenous IV therapy – introducing, Ionic Magnesium (now with CHD clinically tested Fulvic-Acid)! Magnesium supplementation is essential to combat this widespread deficiency epidemic. The conundrum is that most individuals who are magnesium deficient also have impaired absorption, making a bad situation even worse. Your body’s cells require magnesium to activate the biochemical pathway that takes up magnesium. 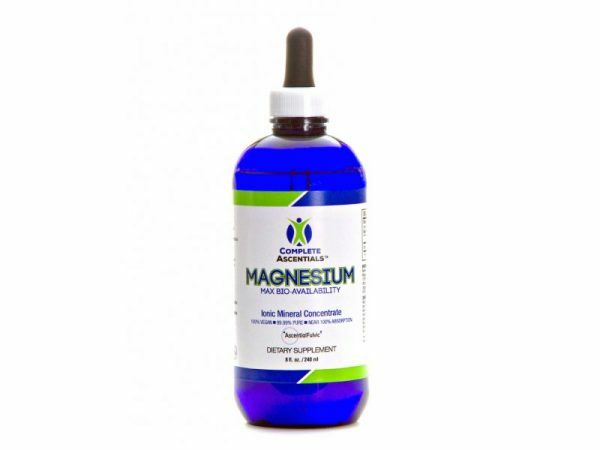 A solution is required that provides magnesium in a near-100% absorbable form and instantly begins replenishing the body’s reserves without losing any momentum. Complete Ascentials™ Magnesium formula comes to the rescue with Ionic-magnesium enhanced with our trademark AscentialFulvic™ – a patented CHD Fulvic-Acid in water energized with 6 Ancient Solfeggio Tones. Saturating The Cells With Bioavailable Magnesium and Supporting The Healing of DNA – is it a possibility? We know that our cGMP certified; Ionic-sized magnesium is the most readily available and absorbable form we could source in our Complete Ascentials™ Magnesium formula. We also included clinically tested CHD Fulvic-Acid in our magnesium solution to increase the bioavailability and enhance the overall value with anti-viral, anti-bacterial, and immune supporting minerals. Finally, since quantum physics has discovered that there is no space in the human cell, and a human cell is an electric-magnetic field of possibility and potential, we use sound-frequencies to complete our exclusive delivery system. Our proprietary technology, AscentialFulvic, pioneers into new territory with the merging of 6 Ancient Solfeggio Tones, including the 528Hz frequency (called the ‘LOVE’ frequency by Dr. Len Horowitz) being used today by biochemists for DNA repair. To experience maximum benefit from Complete Ascentials™ Magnesium, also consider adding our ‘Ascential Kit’. RNA influences DNA and our Complete Ascentials™ DNA Evolve and RNA Spray may assist the body in supporting human potential at the cellular level with Holoresonant, Pharmaceutical-Grade, M-State Advanced Minerals in a Pharmaceutical-Grade Custom Probiotic Matrix that is unlike any nutraceutical out there. We take our quality and research and development seriously, bringing forth what we believe to be the highest standard in product-excellence when it comes to supporting Human Potential and Well-Being. Experience Complete Ascentials™ DNA Evolve with RNA Spray and feel the difference!